This Acetate Front Card Tutorial will show you how to create a card to be really proud of. It is one of the most beautiful cards to create and yet so simple to make and it is sure to "Wow" all those that you send it to. You will need some of the thicker acetate for this design so that the front of the card is protected. If you are new to cardmaking then all these different things that can be added will help you to create the cards you want to make. You will find lots of ideas, folds, techniques and tutorials on the website and if there is anything that you particularly need to know then please contact me. If I know the answer I will gladly share with you ... and if I don't then I will find out. But don't be afraid to try these ideas as none of them are hard and all are within every bodies reach if you are willing to experiment. And of course the more you make the better you will get and in no time at all your designs will be fabulous. The Acetate Front Card Tutorial is just one of many ideas that you may like to make and many of them are in video format. I think this card is really special and imagine what it would be like in white for a beautiful wedding card... and this Acetate Front Card Tutorial will help you get the results you want. What bride wouldn't be pleased to have this as a keepsake of her very special day. You will need to make sure that you leave enough room under the acetate to place your chosen centre. And because of the depth you will need to make a box to send the card. There are several ways to make this and you will find one idea here. 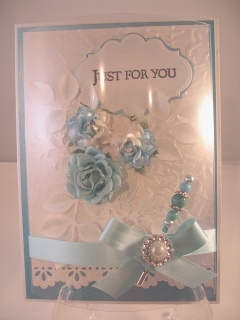 There is also a tutorial using some graph paper that will show you how to get a box for any size card you make. I know it shows some candles but the method can be adapted for any object that you wish to add.